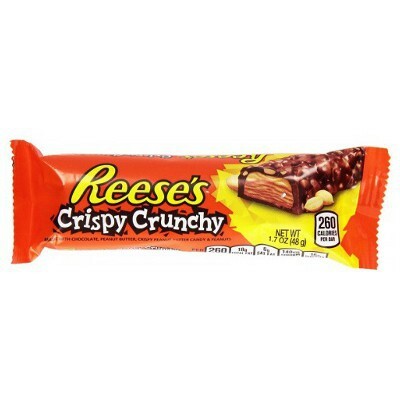 REESE'S Crispy and Crunchy Candy Bar is a delicious combination of creamy Hershey milk chocolate and delicious Reese's peanut butter, teamed up with chopped peanuts for the ultimate candy bar experience! 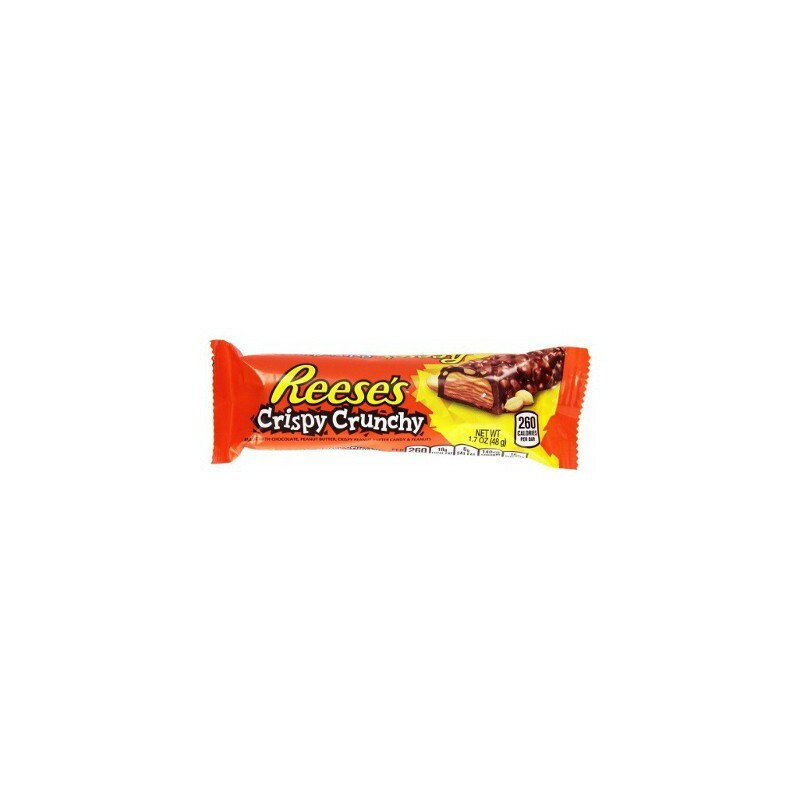 Ideal as a mid-day snack or as a treat at the movies, you can enjoy the best of both worlds: Reese's and Hershey's rolled into one tasty Reese's Crunchy Crispy candy bar. Sugar, peanuts, corn syrup, vegetable oils (cocoa butter, palm kernel, palm, shea, safflower and/or sunflower), chocolate, corn syrup, milk, 2% or less of: lactose (milk), molasses, cocoa, whey (milk), milk fat, nonfat milk, salt, emulsifiers E476-E322 (soy lecithin), artificial flavor, preservative E319. Manufactured in a facility that also processes coconut. Contains GMO. Nutrition facts (for 100g): calories 500Kcal, total fat 29.2g (saturated fat 10.4g), total carbohydrate 56.3g (sugar 43.8g), protein 10.4g, salt 0.5g. Barretta buonissima e croccante come piacciono a me, il sapore del burro di arachidi si sente ed è favoloso con quel retrogusto salato, Ottima! LA barre pour tous les fans Reese's ! trop bon ! Dommage qu'il n'est pas vendu en lot car pour une famille de 5, ça dure pas longtemps. Trop bon! J'ai beaucoup aimé. Dommage que cela ne se vende pas en france. C'est tout simplement excellent.